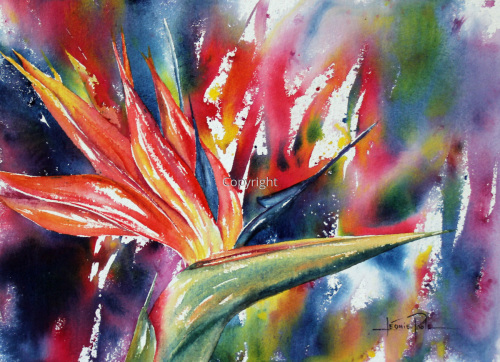 This was a fun painting as I was experimenting with wet on wet painting and this was the result! 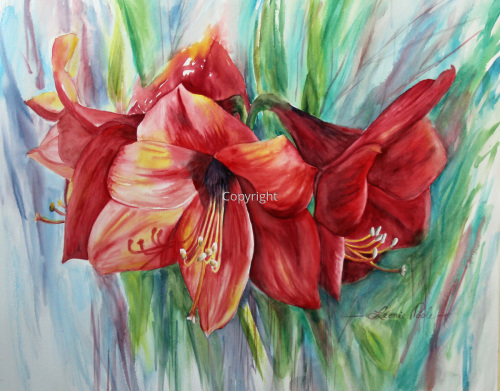 5" x 7"7" x 9.75"9" x 12.5"11" x 15.25"13" x 18"15" x 20.5"
These vibrant red amaryllis bloomed all through the Christmas season. I had to paint them! 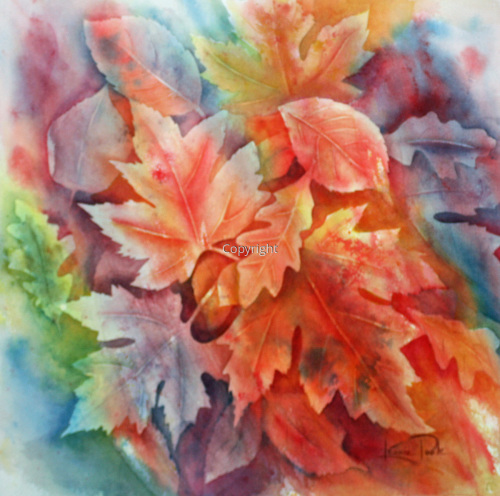 0" x 0"0" x 5"
These leaves were all from my yard. Instead of raking them, I painted them! An award winning painting! 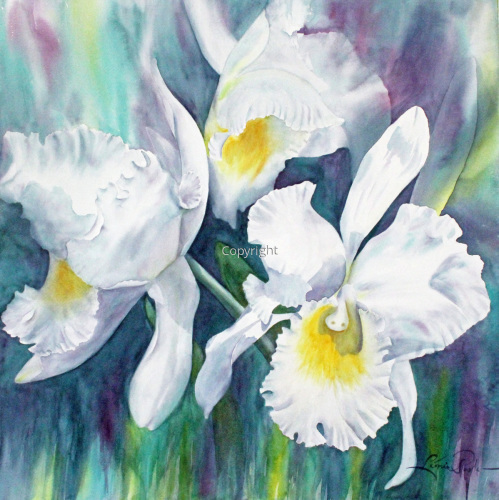 This painting won best of show in the Llloyminster art show in 2016. I was so proud of myself. 6" x 9"7" x 10.5"8" x 12"9" x 13.5"9.5" x 14.25"
5" x 8"7" x 11.25"9" x 14.5"11" x 17.75"13" x 21"17.5" x 28"
These irises were a sure sign Spring had arrived. 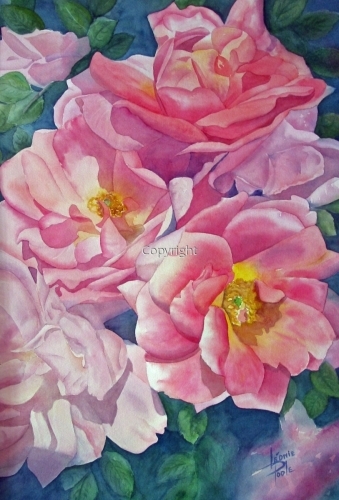 Their colourful and contorted petals were a joy to paint! These Orchids were purchased at an orchid show. Knowing that these beautiful large blooms wouldn't last forever, I took many photos. I used these photos as reference material to sketch and paint this painting. The background is purely imagined. 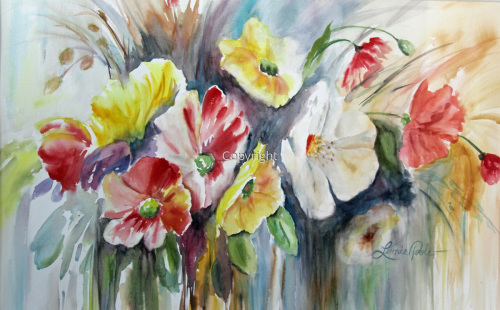 Hope you enjoy the painting as much as I enjoyed the flowers while they were in bloom! Roses from my garden! I can't paint enough of these. They looked so cozy all bunched together. 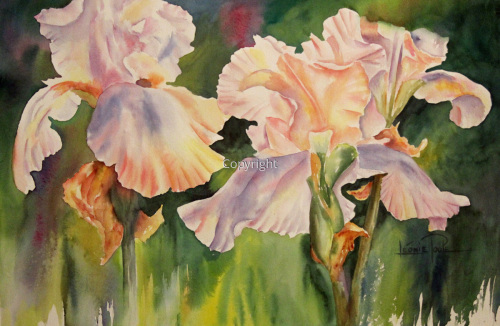 7.5" x 5"8.75" x 6"10.25" x 7"11.75" x 8"12.5" x 8.5"
These Irises were a sure sign of Spring. 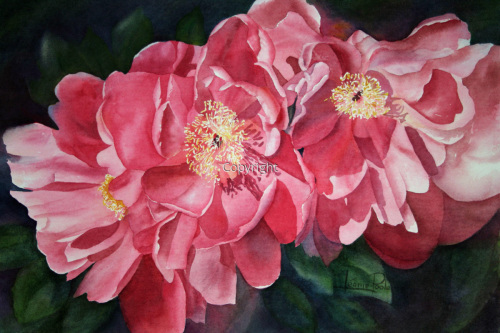 I wanted to show their beauty and elegance in this painting. 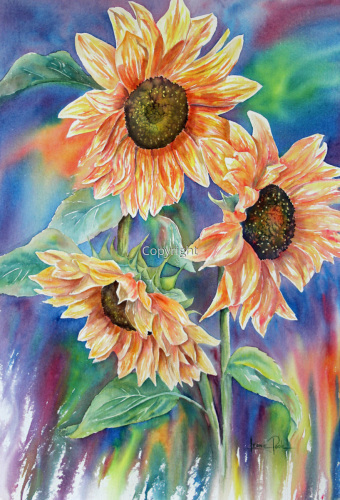 8.5" x 5"11.75" x 7"15.25" x 9"18.5" x 11"22" x 13"
These yellow and orange sunflowers were yelling out to be painted! I couldn't resist and I enjoyed every moment when I painted them. 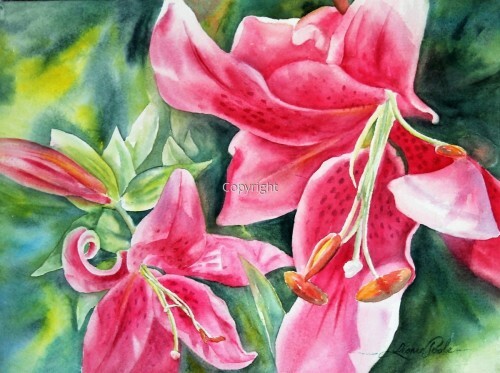 Now they adorn my living room where all winter they reminded me of summer. 9" x 6"18" x 12"20.5" x 14"25" x 17"30" x 20"32" x 21.75"
When I planted these bulbs in my garden, I didn't realize that I would be rewarded with such beautiful blooms. I took many photos and did some quick sketches. 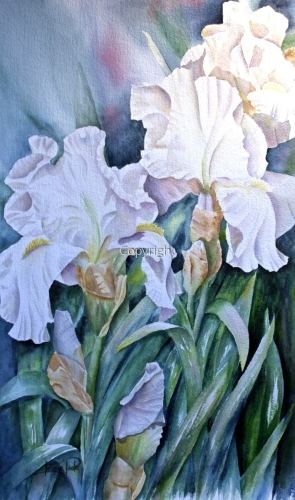 This is my first painting of these gorgeous flowers but I intend to do a few more. 5" x 6.75"6" x 8"7" x 9.25"8" x 10.75"9" x 12"11.5" x 15.25"
For a few weeks every Spring, these peonies are the stars in my garden. It's a pity they don't last very long. I guess their beauty compensates for it. 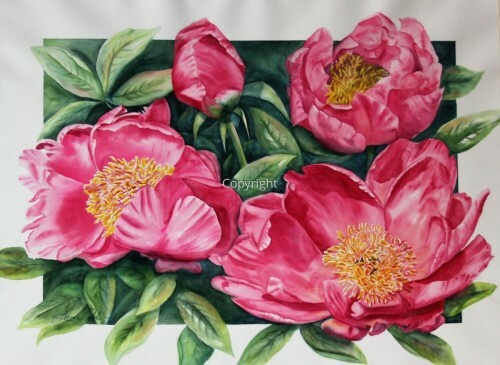 I enjoy painting peonies because a painting of them can be enjoyed all year long! This is the first time I try a composition with a border. I think it helps give them a sense of importance. 5" x 6.75"6" x 8.25"7" x 9.5"8" x 11"9" x 12.25"11.75" x 16"